Lisbon Maine: CDC issues flu vaccine apology: this year's vaccine doesn't work! (NaturalNews) The following video from Gary Franchi of NextNewsNetwork reveals the shocking admission by the CDC that this year's flu vaccine doesn't work. For the first time we can remember, the Centers for Disease Control and Prevention are going on the record, saying the flu vaccine won't work this year. The warning comes just before the busiest part of flu season, in January and February. Unfortunately, there won't be any refund for any of the patients or insurance companies who spent money on flu shots earlier this fall. But don't worry. Just when you thought perhaps the CDC could boost their credibility, they found a way to put a sales pitch on the end of their warning. The CDC says if you do come down with the flu, there's a cure. It's just going to cost more money. Money that will end up profiting pharmaceutical giants, GlaxoSmithKline and Roche. CDC officials are urging doctors to prescribe two specific antiviral medications for any patients who come in with flu symptoms. 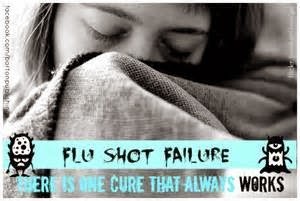 Just last week, the CDC issued a warning, prompting Americans to take the flu vaccine if they haven't already. Health officials said they had 160 million flu shots on the shelves and ready to go. But just earlier this week, Italy launched an official investigation after about a dozen people died within 48 hours of getting the flu shot. Their national health agency issued an immediate warning, saying DON'T take the vaccine. Here in America, the CDC isn't going that far. In fact, they found a way of turning this failed vaccine into a promotion for yet another big pharma drug.